We have a lot going on, the store is kinda crazy. Come see us anyway! Did you see us in the MDJ? 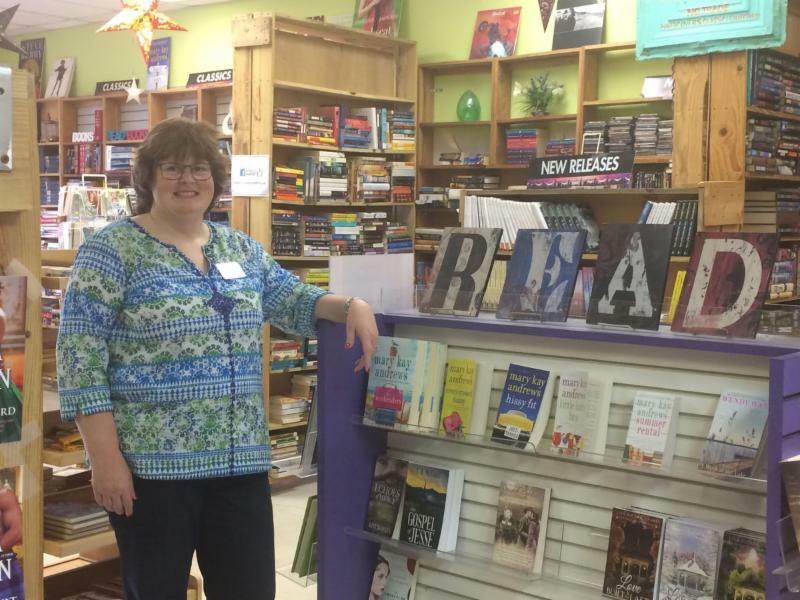 Book Exchange was recently featured in the Marietta Daily Journal. The story focused on the new owner (me) and all of our upcoming changes/events! You can read the article by clicking the link on our Facebook page. 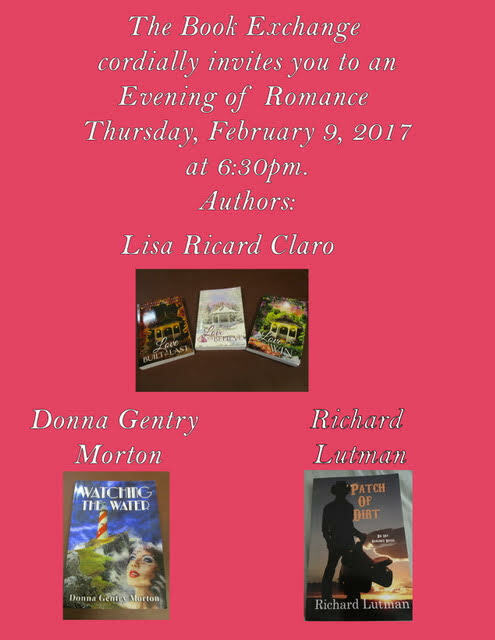 Join us as we welcome authors Richard Lutman, Lisa Ricard Claro and Donna Gentry Morton when we have our Evening of Romance. Patch of Dirt introduces us to Joe Oliver, a womanizing thirty-year old drifter, who meets Frank Hill, sixty-five year old, wounded Vietnam veteran and his twenty-five year old wife Rita. Frank offers Joe a job, which he reluctantly accepts and is duped into becoming part of their plan to sire a child the impotent Frank, is powerless to conceive. Rita puts Joe through a series of tests to determine if he will be the right biological father for their child. Much to Frank’s consternation Rita falls for Joe and jeopardizes their plan.Joe finds himself conflicted about his feelings toward Rita. His ambivalence leads up to the climactic decision he has to make. In Love Built to Last , Maddie can't let go of her dead husband until she hires Caleb to remodel her kitchen. Sparks fly between Caleb and Maddie, see what happens in Book one. In Love to Believe Brenna Kincaid is forced to team up with her nemesis Dante Caravicci to save a friends wedding. Will their competitiveness keep them apart? In Love to Win Rebecca Walker and Sean Kincaid have a friends with benefits relationship, love sneaks in, but will secrets tear them apart? Donna Gentry Morton is the author of Watching the Water. In Watching the Water, book 1 of the Heart Tide Series, Julianna Sheffield is a rogue wave, one that doesn't want to land on the shore it seems destined for. It's 1934 and the currents pushing her include and unscrupulous father determined to keep the family solvent during the Great depression and a greedy fiance named Leyton, who is proving why his name rhymes with Satan. But, Julianna dreams of Jace, follow their story in Watching the Water.